We spent two nights in Dunes with our two grand-daughters, aged seven and almost four. We all loved it and the girls did not want to come home! The apartment has everything you need and is in immaculate condition. It was very soothing waking each morning to see the view across the dunes towards the sand and sea. We will definitely return. Dunes gets five stars from us. Stayed for 3 nights in Pebbles apartment it was gorgeous!! totally immaculate and every need catered for. 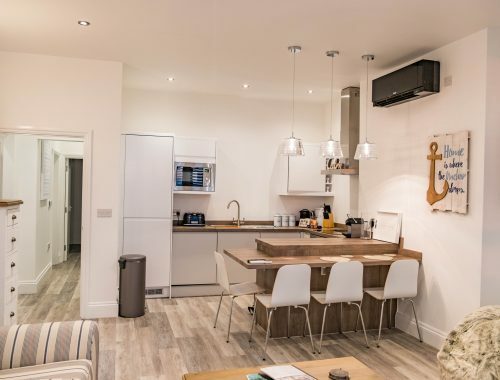 Apartments are done to a really high standard with quality fixtures, fittings and furniture. The welcome pack gives the extra finishing touch. Would definitely return and would highly recommend. 5 star!! I booked Pebbles apartment as a treat for my Mum & Dad and it was just perfect. The apartment was modern, spacious, clean, beautifully furnished and done to a very high standard throughout even down to the fresh flowers! The kitchen has everything you need and the welcome gifts of wine and gorgeous cakes were a lovely surprise. 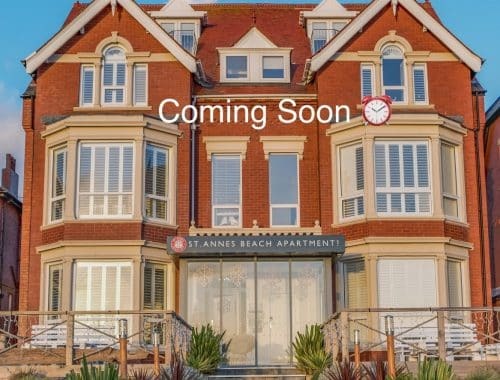 Perfect location only a short walk from the beach and short drive from lovely St Anne’s. My parents had a wonderful 3 days for their Golden Wedding Anniversary and I can’t thank Stuart & Zoe enough. I highly recommend these apartments and will definitely be back. What a wonderful apartment! We stayed in Sunrise and it was totally immaculate and comfortable. 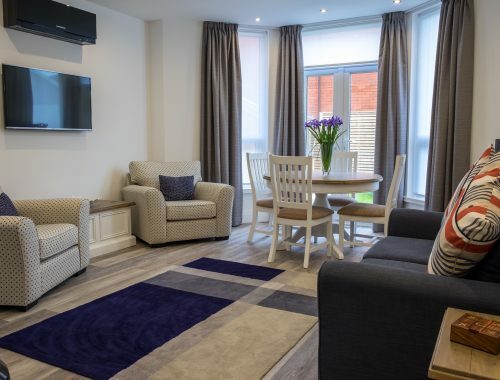 Warm cosy beds in both bedrooms, comfy and spacious living space and a brilliant kitchen - thank you for the freshly baked goodies and Nespresso capsules on arrival! Really clean and high standard of fixtures and fittings too, everything worked perfectly. The location was spot on ... only a couple of minutes from the sea and great for walking to the beach huts and onwards to charming St Anne's. Great bus service within a couple of minutes walk with buses to lovely Lytham and Blackpool. Thanks for such a great winter's weekend - I am sure we will be back soon. Just home from our second fabulous stay at these beautiful apartments. Zoe and Stuart have thought of everything to make you stay just perfect. Even down to the extra touches of your welcome box and birthday balloon. Keep up the good work hopefully will be back in the summer for next stay at these wonderful 5 star apartments. I just cannot recommend these apartments enough. They are spacious, clean, modern and very beautiful. Zoe and Elliot are so lovely. We got stuck on the M55 for 5 hours on our way so Zoe arranged for someone to be at the apartment to accept our online food delivery and turn the heating up for when we arrived later. Just fab. Never visited but they look clean and comfy, maybe next year when we can bring the dog. Back from another fabulous weekend staying at the gorgeous St Anne's Apartments! Zoe and Elliott are the perfect hosts and can't do enough for their occupants! Already planning next year's visit! This is our 3rd year in a row at the apartments so that tells you everything really. I can’t recommend them enough. Spotlessly clean, very well equipped, still look like new, super comfy beds, brilliant location and the welcome cakes just keep getting better! Brownies this year were amazing! Absolutely stunning apartments with everything we needed for our family break. Accommodating and friendly staff who went out of their way to ensure we had everything we needed. Lovely welcome gift on arrival in a home from home luxury apartment. We’ll definitely be staying again! Just had a couple of nights staying at Shoreline apartment. Absolutely loved it. The apartment was gorgeous and spotless. The welcome goodies were delicious and just loved the decor and all the thoughtful little touches. The beds were so comfy. Can’t wait to go again! We stayed at the Dunes apartment for 3 nights this week and it was fantastic. A beautifully appointed apartment, scrupulously clean and some lovely treats waiting for us! Booking and checking in was very easy and the apartment was so well kitted out you really just need to bring yourself and a few clothes. Loved it and hope to be back again soon! Have arrived home after a fantastic few days at the Shoreline apartment. The apartment is beautiful done and nothing was to much from Zoe and her team. The welcome pack was a lovely surprise after our 5hr journey up there. We will definitely be staying again when we next visit St.Annes. A gorgeous long weekend in Pebble aperment; what a treat - lovely arrival gifts, extremely clean, very tasteful decor and excellent facilities. Well done St Anne’s Beach Apartments. We will definitely return. 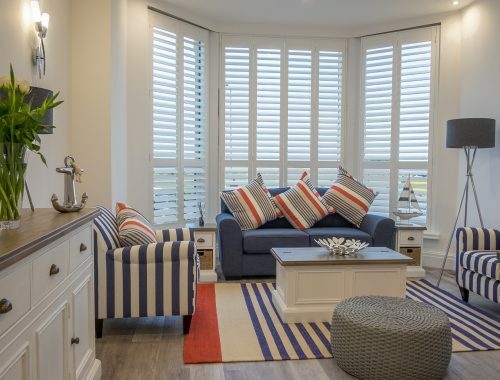 We had a wonderful stay at the apartments; beautifully furnished; exceptionally clean; ideal location- especially for relaxing and just watching the sea. Lots of attention to detail and little extras. Will definitely stay here again. A long weekend with friends in a superb apartment. Not even hurricane Brian could spoil it. Exceptional facilities and decor. Wonderful welcome form Zoe and lovely goodies in fridge! Definitely worth a second visit and will highly recommend to family and friends. First class, 5 stars, absolutely stunning apartments! Beautifully finished & furnshed throughout. Complimentary beach hut & swimming passes along with the arrival pack containing wine, milk butter & cakes! Fantastic communication from staff throughout our stay. Cannot recommend highly enough. Hope to visit again soon. Fantastic apartments. Really well finished and great size for our family of 4. The outdoor area was safe for the children and had lots of great toys to keep them occupied. We will be back! Spent the weekend in Dunes, absolutely beautiful property. The apartments are luxurious yet homely and every detail has been carefully thought out. Everything was spotlessly clean, the fixtures and fittings are fresh and modern, and we loved how bright the whole apartment was. We will most definitely be returning. Thank you for a fantastic weekend! Fantastic stay, yet again. Everything is always perfect. Stayed here last October for a 3 night break. Had the two bedroomed 1st floor front apartment and couldn't have asked for any more. Decor and comfort is impeccable and the location and views are stunning. Would highly recommend. Can't wait to return one day O hope! Absolutely fantastic weekend, apartments spotless and extremely comfortable. Some really nice touches. Highly recommended!!! Absolutely gorgeous! Superbly situated, fantastically appointed, love the decor! The Beach Hut makes the stay, just the most wonderful experience, brunch, late lunch, then dinner, just don't want to leave! Sunset with a G & T in the cutest of comfort, right on the Beach! Loved it! Cannot recommend highly enough! Nice. Lives up to its name..Paradise..found. Visit and enjoy! We stayed in one of these apartments last year with 2 disabled children. Absolutely gorgeous and owners so lovely and helpful. A fab food welcome pack waiting for us and the apartment was just stunning. Can't recommend highly enough. Just left after a weekend stay with family in two of the apartments Seagrass and Pebbles on the ground floor. Wow wow wow !!!!. Beautiful apartments/decor. Spotless and clean. The owners and staff are first class/friendly people. They went out of their way to make our stay perfect. If you are like me and read reviews before booking. Look no further if you want 5star quality apartments �����. We have had the most relaxing few days, the apartment was gorgeous!!! It was the small gestures that made us smile such as the biscuits, cake and wine. We also rented the beach hut for 2 days, we were so lucky with the weather which made it great however if the weather isn't great the beach hut has everything you could need. This was our second visit and we really do love it here, can't wait to come again soon! Thanks Stuart & Zoe! We have just spent a fantastic family day in a beach hut - our second visit and definitely not our last. I can't recommend them highly enough. A little home from home right on the beach front and a great base to explore the surrounding area. Had another lovely day at the beach hut with the family. Looking at the reviews for the apartments it would be fab to win the competition. Would fully recommend a day at the beach huts. Excellent accommodation of a very high standard - lots of nice personal touches on arrival and a very helpful host in Zoe. Sunrise apartment on top floor was perfect for family of four. Fully recommended.